A long time coming, but at what price? It's been the glaring omission on the Apple TV spec sheet for years, but a new report suggests a 4K Apple TV may finally be in the works. That's according to long-time Apple tipster Mark Gurman, reporting for Bloomberg that "people familiar with the matter" have revealed a "renewed focus" on the Cupertino company's set-top box. Potentially ready for release as soon as this year, the box is currently said to be in testing under the codename "J105", and will support ultra-high definition 4K streaming – potentially even HDR content, given the mention of "vivid colors" in the report. The renewed interest in the Apple TV comes in the wake of the appointment of former Amazon Fire TV executive Timothy D. Twerdhal. Apple has lost ground to its Amazon rival, as its drive for greater margins pushes hardware costs high, with Amazon preferring to make its money back through services. 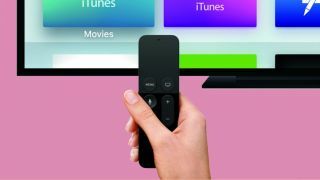 It's an interesting, if somewhat surprising, position from Apple given the success or its smartphone App Store, and one that has seemingly alienated the staff it has working on the Apple TV product. According to the Bloomberg report, there are grumbles among staff who had hoped to make a "revolutionary" device, but "got evolutionary." Still, there's some hope that previous rumored features may yet make a return. Apple TV has long been linked with a cable TV service from Apple – while that full-fat approach may never see the light of day, a web-based, channel-by-channel subscription service could still appear with the arrival of Twerdhal and his predecessor hammering out content deals.